"Positive strength based service that is provided for free." The Healthy Families New York home visiting program matches parents with knowledgeable and caring workers who provide information and support during pregnancy and early childhood. Services include helping families access community resources and services, educating families on parenting and child development, connecting families with medical providers, and assessing children for developmental delays. Home Visiting Programs change the lives of children and their families. 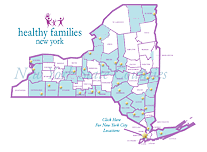 Research shows Healthy Families New York (HFNY) works for many families, from first time teen parents to families with other children. Families have healthier babies, demonstrate better knowledge of parenting and child development, create positive family bonds, develop connections to community services, and have children who do better in school.